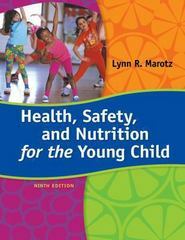 Health, Safety, and Nutrition for the Young Child 9 Edition HEALTH, SAFETY, AND NUTRITION FOR THE YOUNG CHILD, 9th Edition, covers contemporary health, safety, and nutrition needs of infant through school-age children--and guides teachers in implementing effective classroom practices--in one comprehensive, full-color volume. Concepts are backed by the latest research findings and linked to NAEYC standards. The book emphasizes the importance of respecting and partnering with families to help children establish healthy lifestyles and achieve their learning potential. Early childhood educators, professionals, and families will find the latest research and information on many topics of significant concern, including food safety, emergency and disaster preparedness, childhood obesity, children's mental health, bullying, resilience, chronic and acute health conditions, environmental quality, and children with special medical needs. Also provided are easy-to-access checklists, guidelines, and activities that no early childhood student or professional should be without.